Performance Time: Approximately 120 minutes, 97 pgs. FARCE. 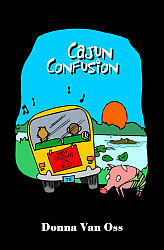 While on their way to New Orleans, a high school show choir from Texas takes a wrong turn and finds themselves lost in the Cajun countryside. Hungry and tired, the group finds lodging at Thibodeaux’s Bed and Breakfast, where Clotile, a Cajun palm reader who works voodoo spells, warms up some gator steaks, possum stew, and squirrel casserole for the weary travelers. The next morning, the students discover that their bus won’t start and that they are stranded. With no phone at Thibodeaux’s and no cell phone service, the students seek the help of Clotile’s husband, Clovis. The only problem is that Clovis’ accent is so thick no one can understand him. But with Clotile translating, Clovis tells the students that he will have to row his pirogue down the bayou to fetch a mechanic, which will only take 2-3 days. In the meantime, the students have to endure the pranks of a mischievous Cajun ghost all the while trying to convince their spacey bus driver that they aren’t in New Orleans!